LS art teacher Alison Wells teaching girls about portraits. 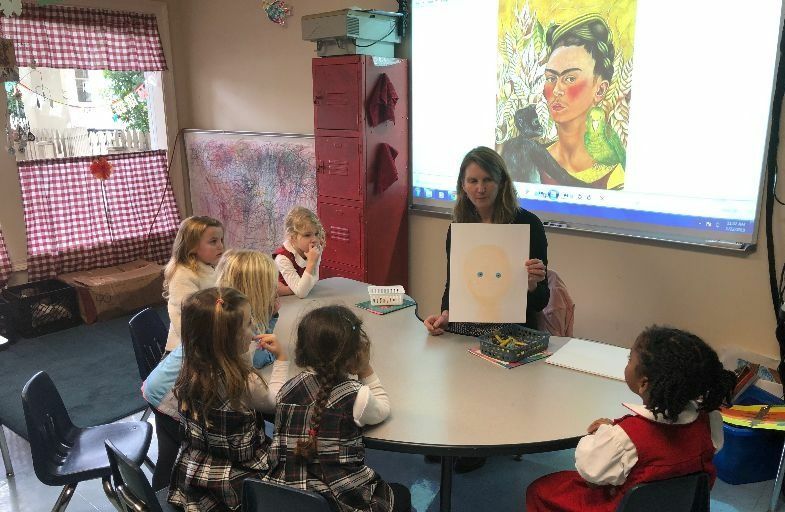 In Art, Pre-K girls have been studying portraits. They first drew a pencil portrait, tracing cutouts of a head and eyes to get started. The girls worked on the details of the eyes, (iris, pupils, lashes, brows), nose (two nostrils), and mouth (top and bottom lip). Next, the Ladybugs looked at the self-portraits of Frida Kahlo. From her paintings they could discern that she loved jewelry, clothes, costumes and flowers. The girls are enjoying the process of drawing their own self-portraits in soft and oil pastel.